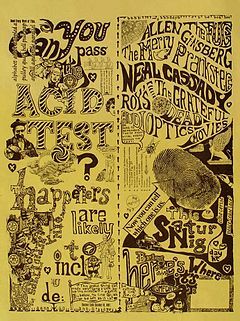 The Acid Tests were a series of parties held by author Ken Kesey primarily in the San Francisco Bay Area during the mid-1960s, centered entirely on the use of, and advocacy of, the psychedelic drug LSD, also known as "acid". LSD was not made illegal in California until October 6, 1966. The name "Acid Test" was coined by Kesey, after the term "acid test" used by gold miners in the 1850s. He began throwing parties at his farm at La Honda, California. The Merry Pranksters were central to organizing the Acid Tests, including Pranksters such as Lee Quarnstrom and Neal Cassady. Other people, such as LSD chemists Owsley Stanley and Tim Scully, were involved as well. Ramon Sender co-produced the Trips Festival with Ken Kesey and Stewart Brand. It was a three-day event that, in conjunction with The Merry Pranksters, brought together the nascent hippie movement for the first time. The Trips Festival was held at the Longshoreman's Hall in San Francisco in January 1966. Counterculture sound engineer Ken Babbs is mostly credited for the sound systems he created for the Trips Festival. Prior to Babbs' creation, it was discovered that particular music usually sounded distorted when cranked to high levels because of the cement floor on the San Francisco Longshoreman's Union Hall (where the Trips Festival was taking place). Babbs being a sound engineer resolved the problem. He made sound amplifiers that would not create distorted sounds when turned up to high sound levels. Organized by Stewart Brand, Ken Kesey, Owsley Stanley, Zach Stewart and others, ten thousand people attended this sold-out event, with a thousand more turned away each night. On Saturday January 22, the Grateful Dead and Big Brother and the Holding Company came on stage, and 6,000 people arrived to imbibe punch spiked with LSD and to witness one of the first fully developed light shows of the era. Big Brother and the Holding Company was formed at the Trips Festival. In the audience was painter and jazz drummer David Getz, who soon joined the band. ^ "Tom Wolfe". www.tomwolfe.com. Retrieved 2017-03-18. ^ "Psychedelic 60s: Ken Kesey & the Merry Pranksters". 2009-12-16. ^ "December 18, 1965: The Big Beat, Palo Alto--Lost and Found". 2013-04-11. ^ View KRON-TV newsfilm of the Whatever it is Festival, from 9/30/1966: https://diva.sfsu.edu/collections/sfbatv/bundles/209388. ^ "Lysergic Pranksters in Texas". 2014-11-20. Archived from the original on 2011-08-14. Retrieved 2014-11-21. ^ United States Congress (October 24, 1968). "Staggers-Dodd Bill, Public Law 90-639" (PDF). Retrieved September 8, 2009. ^ Brant, Marley (2008). Join Together: Forty Years of the Rock Music Festival. Hal Leonard Corporation. p. 16. ^ Sinclair, Mick (2004). San Francisco: a cultural and literary history. Interlink Books. p. 204. ^ "Chronology". janisjoplin.net. 1998–2010. Retrieved 10 June 2010. Wolfe, Tom (1968). The Electric Kool-Aid Acid Test. Lesh, Phil. "The Acid Test Chronicles - Page 16 - Portland Oregon - 6th Acid Test - Jan. 15, 1966". Acid Test Chronicles. Archived from the original on 2012-04-25. Retrieved 2012-04-09.